Do Hair Transplant Scars Ever Fully Go Away? Follicular Unit Transplantation (FUT) – this is also known as the ‘strip method’ of hair transplantation surgeries. It involves your surgeon removing thin strips of skin from your scalp using a scalpel, usually from the back and sides, that contain strong hair follicles. This is called the donor area. These strips of skin are then carefully separated out into separate follicular units in sterile petri dishes or similar by specialist teams of nurses. Meanwhile, your surgeon makes small holes in your scalp where you’d like hair to be transplanted, called the recipient area. The individual follicular units are then gradually placed, or ‘grafted’ into these holes. Follicular Unit Extraction (FUE) – this is the more modern type of hair transplantation surgery and is highly specialised. It involves your surgeon taking individual follicular units from the donor area on the back of your scalp using a specialised tool, rather than whole strips of skin. These individual follicular units are then transferred directly to the recipient area using another specialised too, this time a microneedle that can puncture holes in the skin small enough to take the freshly removed follicles. Both aim to produce a natural hairline and hair that all grows in the same direction. But it’s perhaps easy to see why the Follicular Unit Transplantation (FUT) method leaves behind more scars than the more advanced Follicular Unit Extraction (FUE) method. Removing a strip of skin is more likely to cause scarring than removing tiny, individual hair follicles. Here at the DK Hair Klinik in Antalya, we’re proud to offer the expert and highly advanced FUE method of hair transplant surgery. We see thousands of patients, who, just like you, were wondering whether a hair transplant would leave visible and tell take scars. And they all leave happy in the knowledge that if they don’t want people thy meet to know they’ve had a hair transplant, they don’t have to tell them, or be found out by visible scars. Just like with anything that leaves a permanent mark on our skin, it’s a lifelong reminder of an accident, operation or something in our past that doesn’t evoke great or happy memories. A childhood fall, an appendix operation, a hair transplant. We either don’t want to be reminded of something bad that’s happened, or of how we looked before we took the bold step to correct it. 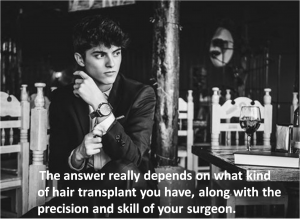 And that’s why we use the FUE method, which leaves little to no scarring, so that our patients are free to live their lives with the hair they want, without hair transplant scars reminding them of a thin haired past, or giving them away. The FUE method also happens to be considered far more superior and advanced than the FUT method, too. The FUT method is still effective however, and some clinics will offer a choice between the two. If you choose to have it, then the level of scarring that you experience will depend on how well you heal, the skill of your surgeon and the size and number of strips of skin that are removed for harvesting follicles. If you have more advanced hair loss, or you like to have a particularly short hairstyle, then your scarring will probably be more visible due to the lack of hair that can cover the back of your head. 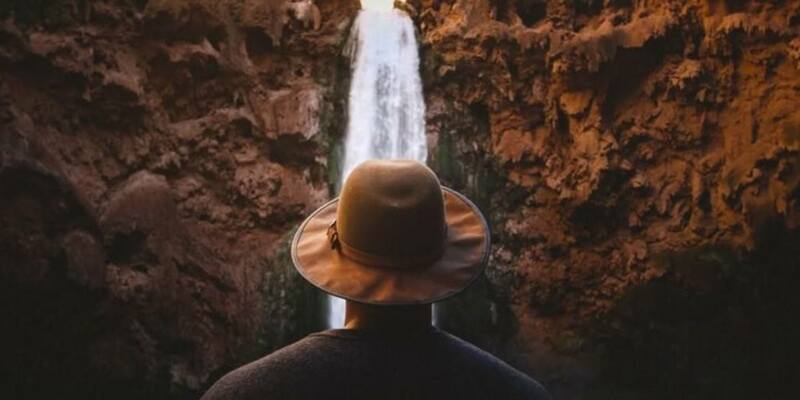 The scar left behind after an FUT hair transplant is likely to be a long, thin, linear scar, running around the back of the scalp, possibly from ear to ear. If you’re unfortunate enough to have had a bad experience with an unskilled surgeon, your scar may be considerably bigger and look much worse. Also, if your fresh scar becomes infected in the early weeks post procedure whilst it’s still healing, then it could also end up looking worse. An infection can be ‘hospital acquired’, meaning that you picked it up whilst you were in the clinic. This usually means that their cleanliness with surgical tools and in their treatment rooms is questionable. You can also pick up an infection at home whilst you’re healing if you don’t follow the post procedure advice from your surgeon. This is usually to rest and avoid strenuous activity and further advice on how to keep the area clean. Infections after a hair transplant are rare but can have serious repercussions for your recovery and future scarring if you do develop one. Scalp micropigmentation – this is often used as an alternative to a hair transplant, but can also be used to cover up hair transplant scarring. Scalp micropigmentation is a form of scalp tattooing, whereby experts literally colour in areas of the scalp where the hair is thinning with thousands of tiny dots in a colour close to that of the natural hair. The idea is that it makes the scalp appear like it has a full covering of shortly cropped, or shaved, hair. With a hair transplant, or any other scalp injury scar, the same technique is used to cover up the scar. Scalp micropigmentation can also be used to fill in any gaps or thinning areas after a hair transplant. Fractional laser treatment – often used in beauty salons (albeit at different laser frequencies, depending on the treatment) as a hair removal treatment or to help reduce the appearance of fine lines and wrinkles, this can also be used to help minimise scarring. Laser treatments such as these generally use highly powered lasers to puncture tiny holes in the surface of the skin. The skin then goes into rejuvenation mode to heal all these little holes, and in doing so, helps to smooth out scars (and wrinkles). It’s a very targeted treatment that stimulates the production of collagen. Collagen is the substance in our skin that’s abundant when we’re young, giving us plump and smooth skin, but that diminishes as we get older. « Does Regular Exercise Accelerate or Prevent Hair Loss?